Right now, if a person were to develop an interest in the Catholic faith and got onto Facebook or Twitter to see what Catholics are saying, they'd see a whole lot of complaining and anger, but not much love. In my opinion, we are our own worst enemy. A good Catholic apologist knows that love must be the only reason we engage in a discussion/argument about our faith. Share with those who ask out of genuine curiosity. Share with those who ask because they want to know. Walk away from the need to win and make sure you engage only out of love and/or because of love. . . . Always, always, always remember that truth is a person: Jesus Christ. We do not want to abuse truth or use it as a weapon to bludgeon people who irritate us. If someone asks questions and sincerely wants to know, meet them in that holy curiosity and bring truth with you. Share what you have learned with joy and good humor. Let God do the rest - it will blow you away. The first is The Hope of Lent: Daily Reflections from Pope Francis by Diane Houdek. In the Introduction, Houdek writes, "Lent is a time to discover the extraordinary in the ordinary, to be surprised by God's mercy when we least expect it. As the season begins, think about the hopes you have for Lent this year. Think about what changes you want to see in your life, in the world. Let the words of Pope Francis guide you on a journey of bringing those hopes to fulfillment,"
This book is able to be used any liturgical year. Each day features a listing of the Scripture readings for that day. This is followed by a quote from Pope Francis and a reflection from Houdek that considers both the Scripture reading and the Pope's teaching. Reflection questions and a prayer from Pope Francis end the day's entry. Pope Francis' very practical life-based theology resonates on every page of this book. Combined with Houdek's reflections, it offers much food for thought. The second is Lent with Saint Teresa of Calcutta: Daily Meditations by Heidi Hess Saxton. St. Teresa of Calcutta and her Missionaries of Charity offer such an example of selfless love, of seeing Jesus in everyone we meet. Saxton writes, "As we contemplate Scripture and the life and teachings of St. Teresa of Calcutta during this Lent, we have a daily inspiration and opportunity in spreading Christ's fragrance to others. And whatever the future holds - pain or healing, uncertainty or assurance, dismay or delight - we can anticipate with great joy the glory of the Risen Christ at our journey's end." This book is able to be used any liturgical year and includes a listing of the Scripture readings for each day. A short Scripture quote is included which Saxton then offers a reflection on, including stories about St. Teresa and her sisters as well as from her own life and experience. This is followed by reflection questions and a prayer. St. Teresa and Saxton invite us to minister directly to those around us, to serve others, and to love until it hurts. Putting the teachings of this book into practice will help you cultivate a generous heart. The following is part of the entry from February 20th in The Catholic Mom's Prayer Companion. This particular entry was written by Donna-Marie Cooper O'Boyle. Mother Teresa pointed out that true love always hurts in some way. We can't run away from the pain that we sometimes encounter when caring for our family, but we can make a decision to embrace it and recognize it that it is within the mystery of loving sacrifice that miracles happen. God will grant us the graces we need to love with his love. We should ask for those graces often. Dear Lord Jesus, please grant me the graces I need this day to love with your love and to offer my hurt to you so that you will transform it all into beautiful blessings for my family. I'm not someone who usually suffers from a lack of ideas. Actually I suffer from the opposite problem - too many ideas and not enough time and money to follow through on them. 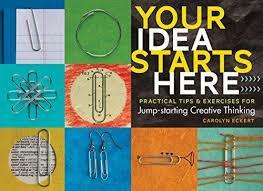 That being said, Your Idea Starts Here: 77 Mind-Expanding Ways to Unleash Your Creativity is an inspiring book for anyone who is creative by nature, suffering from a temporary creative block, or seeking to be a more creative person. As a book reviewer, I always have a book with me, taking advantage of every free moment in my life to get some reading done (those little spurts add up!). I took Couriers of Grace with me to my daughter's Irish dance class this past Saturday which is held at a local social club. Parents have to either leave or sit downstairs in the (not open) bar area. So, there I was, sitting on a stool in a poorly lit bar, reading this book, tears pouring down my face, trying to wipe them away before anyone noticed. Now that you have that image, I'll share my official review. 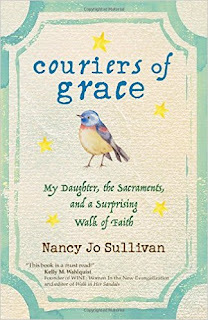 Nancy Jo Sullivan pens a loving tribute to her daughter Sarah while offering a message for all of us in Couriers of Grace: My Daughter, the Sacraments, and a Surprising Walk of Faith (Ave Maria Press, 2017). When Sullivan was twenty-six, she gave birth to her first child. As she and her husband marveled at the baby’s beauty and perfection, the doctors informed them of the unexpected diagnosis: Sarah had Down syndrome. It was the first time in her life that Sullivan ever asked, “Why God?” In the midst of that questioning, she had a mystical experience in which she heard the Lord say, “This child is a gift.” Sarah only lived to be twenty-three, but as Sullivan writes, her “life, in essence, was a sacrament, a visible sign of God’s grace. Through her, God transfigured me, my family, and all those who knew her.” In a world in which so many children with Down syndrome are aborted before they ever have a chance to live outside the womb, Sarah’s life bears witness to the worth and importance of every human being. 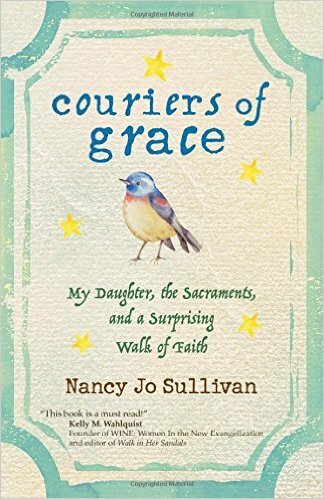 Sullivan tells the story of her daughter’s life and her own experience of being her mother as those tales relate to the Catholic seven sacraments: Baptism, Reconciliation, Eucharist, Confirmation, Marriage, Holy Orders, and Anointing of the Sick. While Sarah would personally only receive two of those sacraments, her mother has found lessons in all of them. Reflection questions are included that are appropriate for both personal and group use. Couriers of Grace is a profoundly beautiful, hope-filled, and heart-wrenching book. Be sure to have a box of tissues nearby as you read.